I read and enjoyed Sarah Addison Allen’s Garden Spells a few months ago and ever since then, I’ve had her other books on my wish list. I’ve seen some of them around, but never The Sugar Queen. I know friends have seen copies of this everywhere, but it remains elusive. So I figured, if other people can see it more than I do, then they can probably get it for me for Christmas right? Imagine my delight when Monique sent me this book as a Kindle gift. Squee! Thank you! :) I wasn’t planning to read this anytime soon, but Chachic‘s Christmas Reads post got me craving for something Christmas-y. Unfortunately, I don’t have a book that specifically fits the season, unlike last year when I had Dash and Lily’s Book of Dares. The next best thing was to look for books that had the closest atmosphere to Christmas and wouldn’t be so taxing to the mind. And that brought me back to my first Kindle gift, The Sugar Queen. Josey Cirrini had always lived in the shadow of her mother, because she felt the need to repay her for all the grief she had put her mother up to when she was a kid. Now at twenty seven, she lives at home, answers to the beck and call of her mom, eats her secret stash of sweets and reads romance novels in the privacy of her bedroom closet. Until one night, she finds Della Lee hiding inside her closet, threatening her of blackmail of the contents of her closet if Josey didn’t do what she asked. Della urges Josey to befriend Chloe Finley, a young woman who just came from a break-up with her boyfriend Jake, who also happens to be the best friend of Josey’s crush, mailman Adam. Josey’s world opens up and she discovers things about herself and her surroundings that she never knew, and also builds a friendship and a romance she never expected. Della’s work is now done, but it wasn’t long before Josey finds out the real reason why the older woman was hiding in her closet. 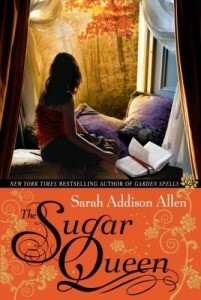 Now there is really something about Sarah Addison Allen novels that is just so comforting. It’s like she brings magical realism into real life, and it makes me want to believe that the things happening in her books were real. Like Clare in Garden Spells, Josey tends to keep by herself, but this time not because of her routine, but because she felt that she needed to be good after all the embarrassment she made her mom go through. Josey was kind of a tough character to like, but that’s mostly because I’m don’t think I have too much in common with her. But then, I also think Josey’s mom is a tougher nut to crack. I really didn’t like her especially with how she puts her daughter down if only to keep Josey home to order around. However, it was fairly easy to like Della and Chloe. Della was a bit of an oddball, but I liked how random she seemed to the point of nonsense but ends up making sense in the end. Chloe is my favorite character, though, if only for her special “ability”. No, it’s not sandwich making (although from the descriptions, she seemed to make very good sandwiches), but how books tend to follow her everywhere. Imagine how a book would just magically appear to you whenever you need it, depending on how you feel? The bookworm in me (which is really…well, me) would be delighted with that kind of magic — maybe I should choose that as my superpower instead? But other than that, Chloe was also a strong character and a perfect complement to Josey. I liked how the relationships of the people unfolded out here. Josey’s friendship with Chloe and Della, Josey’s relationship with her mom, Chloe and Jake’s romance and Josey and Adam’s. While I wasn’t a fan of what Jake did, I really couldn’t think of any other way for his relationship with Chloe would go. I’m no judge of course, but I don’t know what I’d do if I were in Chloe’s place. On the other hand, I loved Josey and Adam’s banter. I loved the uncertainty, the push and the pull, the smiles. I was positively thrilled when someone finally made a move, and how natural the progression of their relationship felt. I loved Chloe as a character as well! I agree that she was very easy to like. AND omg I wish I had her special ability. I did like Josie too, but because I felt sad for her and then excited when she starts to get out from under her mother’s thumb. Glad you enjoyed this. ALSO it gives me hope for Garden Spells because I haven’t read it yet and if it’s better than I am SO excited for it!! Sarah Addison Allen’s books really are comfort reads, aren’t they? My favorite is still Garden Spells but I enjoyed reading all of them. Hope you have fun going through the rest of her backlist. :) You’re right, this one is a really good read for this season. I can’t wait to read The Girl Who Chased the Moon (although some of the reviews for it aren’t good). I love its cover, and I thought it had such a whimsical title. :) It was just so easy to sink into her books and lose myself in there without really jumping into a new world since it’s all magical realism. Yay, glad you liked this one too. Reading this review, I feel like your reaction is pretty similar to what mine was. How great would it be to have that magic – where books find you?! I would love it. Yeah. We’d never really have to buy books again. But I wonder if it would mean good books all the time, you know? :D LOL.